“Entertain and educate” seems to be author J.M. 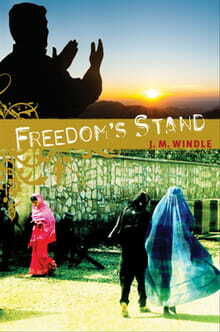 Windle’s unofficial slogan with six novels set in international hot spots such as Columbia, Guatemala, Bolivia, and now Afghanistan. Freedom’s Stand, the sequel to 2009’s Veiled Freedom, concludes the story of relief worker Amy Mallory, her former assistant, Jamil, and Special Forces veteran-turned-security expert Steve Wilson. With high drama and emotion, these characters discover the plans and purposes that God set before them in the religiously and culturally divided country. Amy has invested her life in improving the lives of women and children of Afghanistan. When she returns from a short sabbatical, the changes made by her organization’s new director both shock and dismay her. Their visions for the Afghan people differ, and Amy must decide how far she will go in fighting for the freedom of her treasured Afghan friends. In the meantime, Jamil—the former (and unsuccessful) jihadist—has embraced his new devotion to Isa Masih (Jesus the Messiah) by traveling the rural areas of his country working as a healer and speaking of Isa to those who would listen. Amy rejoices in his transformation; Steve, who has a history with Jamil, is not so trusting. When Jamil is arrested for apostasy and set up to betray his faith, he is forced to make an irreversible decision. Steve, now working as a security director for a leading presidential candidate, wanders in and out of both Amy’s and Jamil’s lives. He is bothered by both of them, for very different reasons, yet both affect Steve’s spiritual journey in profound ways. The consummate military professional, Steve must learn how to walk not by might but by faith. Windle opens a fascinating window into Afghan culture. How do the political headlines reflect actual events behind the scenes? What do local villagers think about jihad? Want to know what a typical girl might think or feel as she is bartered to an unknown husband? Why might some women approve of the way their daughters are sold? Do all Afghan families feel the same way? The details of daily life that Windle paints will both broaden your understanding of the culture while also sharpening your focus on individuals who, though a world apart, are just as human as you. Freedom’s Stand would be a much richer story if I’d already read Veiled Freedom, but the author gave enough back story to fill in the necessary information. Obviously Jamil, Amy and Steve had experienced much together that could not be retold in detail, but the intricacies of their relationships to one another were well-established, allowing the conclusion to play out without missing important nuances. Unfortunately, the frequent references to past events bog down the pace of the story at one point. Push through that slow part, because the second half of the book races toward a stunning conclusion. Realistic, gripping, but in no way soothing—this story is as disturbing as its ending is satisfying. If you are the least bit interested in current events, social justice, or the gospel of Isa Masih, Windle delivers her trademark educating through entertainment with this work.